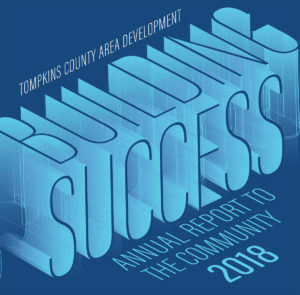 TCAD held it’s 2018 Annual Report to the Community breakfast event on April 25th and hosted a full house of attendees interested in learning about economic development in the County. Retiring President Michael Stamm presented TCAD’s accomplishments from 2017 along with challenges and opportunities facing Tompkins County. The highlighted projects such as City Centre, Harold’s Square, and the Tompkins Trust Company headquarters building. Following Michael’s presentation, Susan Brown, Herman M. Cohn Professor of Agriculture and Life Sciences at Cornell University gave a fascinating presentation on the Cornell apple breeding program that she leads. She also discussed to of the most recent apple varieties she has named – SnapDragon™ and RubyFrost™. Read more about the event in an article by The Ithaca Journal.